I wish I was the kind of person who just naturally knows what to clean and when. You know those people who look at you funny when you mention things like cleaning schedules and checklists? Sadly, I’m not, and I’m ok with that – most days. House cleaning and I seem to have this on again off again relationship. Some days I’m able to knock it all off my to-do list, and others I’m lucky if my top three things get done. There are days where I feel like an absolute failure in the home management department. Which is why including a cleaning schedule in my home management binder is so important for me. My home maintenance or cleaning section of my home management binder is one of my most used sections. In addition to the seasonal home maintenance checklists I also like to keep a copy of my current cleaning schedule and a few copies of a cleaning checklist to help me when I’m trying to reinforce my routines. I have two separate pages because one I use to plan with and the other is for accountability. My cleaning schedule acts as my brain when it comes to the housework. I rely on a carefully craft schedule to help keep me on track. By carefully crafted, I mean that I need to spread my house cleaning tasks out or they’ll never get done. I do this by breaking it down by what needs to be done daily, weekly, monthly, and seasonally. 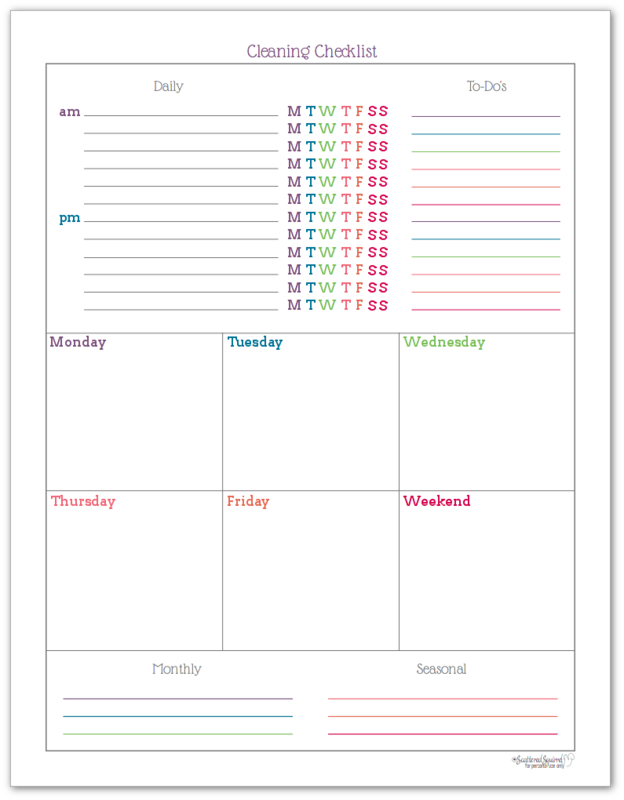 I use this schedule during my monthly and weekly planning sessions to help make sure I’m not forgetting something. It’s not a perfect system, but it works well for me. I break up my daily tasks into morning and evening sections. This helps me balance out my day a little better. Next are the weekly tasks that I assign to a day of the week. The weekend days are grouped together because I don’t want to have to clean much on the weekends. The monthly section is set up like a checklist/grid so I can check them off as they are done. I also cross off months for those tasks that are more of an every-two-months kind of task. I don’t really break my seasonal tasks up into actual seasons, I just list them here so I can quickly see what needs to be done. I also cross them off as they’re completed. The next printable in my home cleaning arsenal is my cleaning checklist. This printable is the one I use for accountability. I keep a few of them in my home management binder so I can pull them out and put them in my planner as needed. I’ve been finding that this is extremely helpful when I start feeling overwhelmed by the house, especially when life gets really busy for us. I cross off the initial of the day as I complete my daily tasks. I schedule my weekly tasks into the days of the week boxes. I also use the days of the week boxes to jot down any other household tasks that need to be tackled that week. I note any monthly or seasonal jobs that need to be done at the bottom so that I can schedule them into the week where I have time. 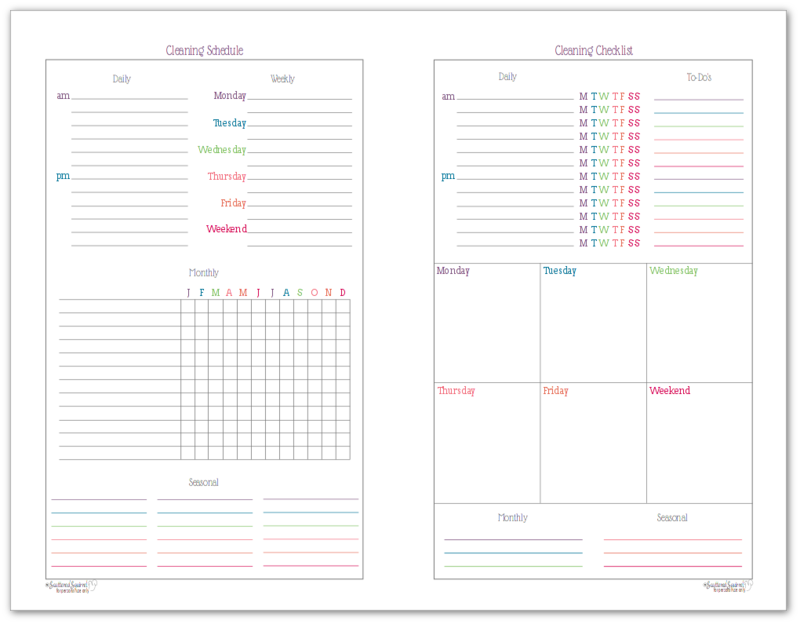 You could use the cleaning checklist as a weekly planner if you wanted too. There isn’t much room in the boxes, but it could work. The half-size versions are identically to the full-size ones. 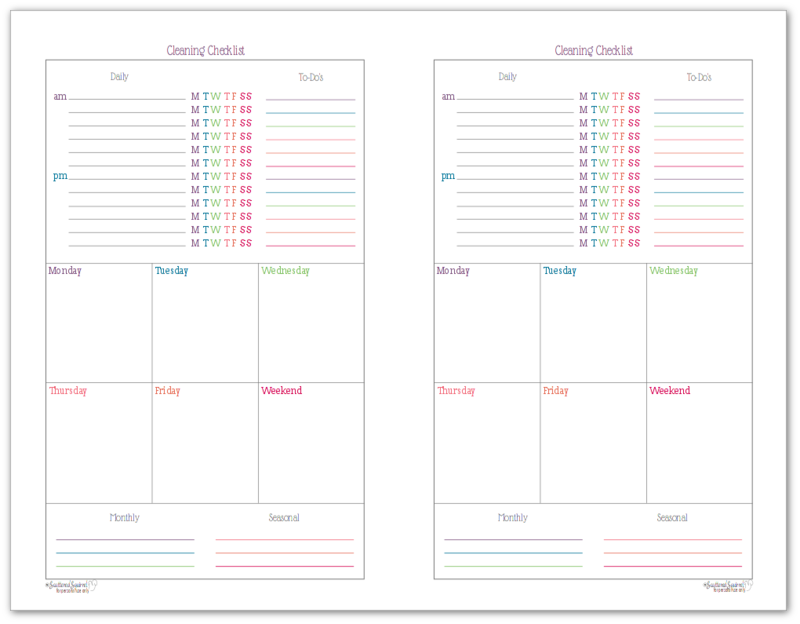 I paired the cleaning schedule with the checklist for one of them, and also made one that is just the cleaning checklists so you can print multiples of those if you would like too. As always, to grab a copy for yourself simply click the picture and you’ll be taken to the download page. Having a space to keep all my house cleaning tasks organized has been a tremendous help for me. I like not having to think about what needs to be done around the house, I just look at the list and do the job it tells me to do. Which is really handy if you’re like me and seem to have blinders on when it comes to house cleaning tasks. 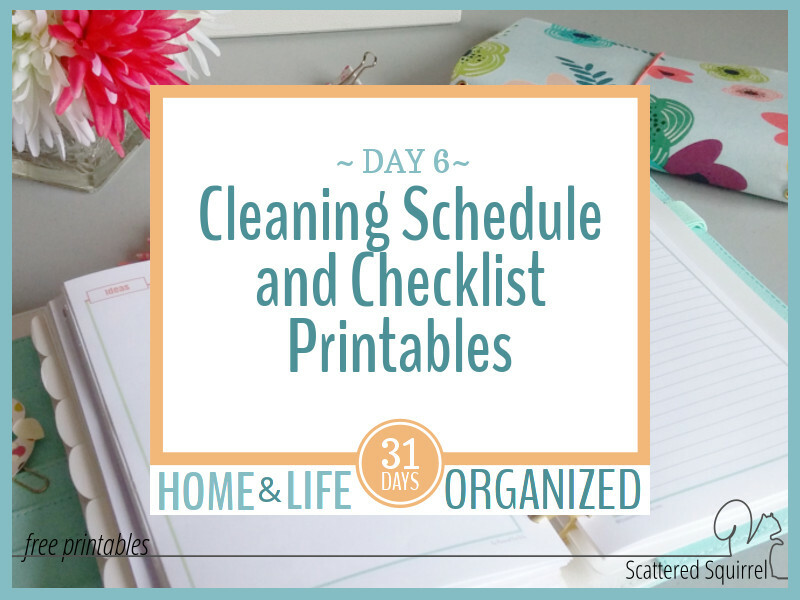 I have a couple other printables that I also use in my cleaning section, which I’ll be sharing in the next post and then we’re moving on to a new section. What do you think so far? 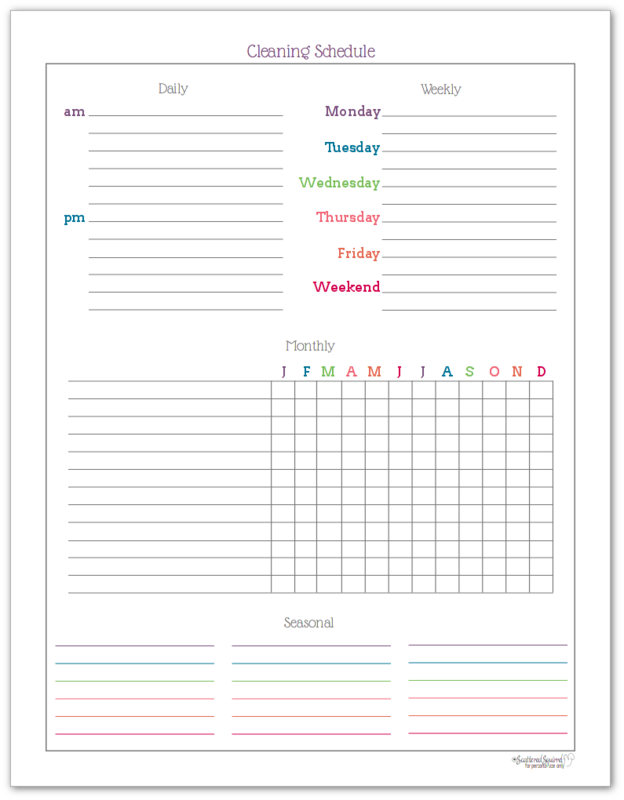 Are you finding some printables that will work in your home management binder? Are you still wondering if you need a home management notebook/binder/system or what to put in yours? I want to hear your thoughts, so go ahead and share them in the comments below. My first Q & A live video is coming up. I was hoping to have done it all ready, but with the technical glitches we had with the program I use to make the printables, I opted to focus my time on finishing the printables. (technical glitches is the nice way of saying it messed up half the printables and I had to start from scratch grrrr) The video is coming though, so if you have any questions feel free to drop them in the Facebook post embedded below or in the comments section. I love to be organized, but so much that I get ADD. This helps so much!